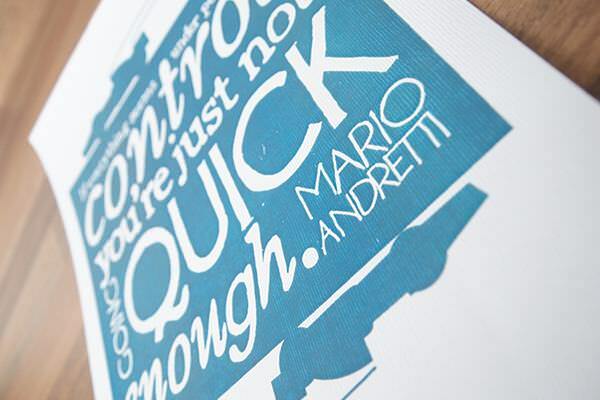 Sam Osborne, graphic designer, illustrator and long time F1 fan has created a series of prints using quotes from a selection of World Champion drivers. Inspired by seeing the recent Senna Movie the series also includes quotes form Mario Andretti and Juan Manual Fangio. Here, Sam explains her inspiration for making art out of Formula One. My Dad worked for car magazines. He was a photographer who spent lots of time at race tracks and also knew loads of weekend amateur racing drivers so I grew up around motorsport and cars. Some of my earliest memories involve watching Formula 1 with Dad and his friends, so I couldn't help but develop a love for it. Motorsport is still something Dad and I enjoy together - I bought him Superbike tickets last Christmas and we had a fantastic day out, both stood as close as possible to the track with our camera grinning like idiots! I make the prints by hand rendering the text - indulging my love of typography - using my trusty fineliners. This is then scanned, digitised and added to the illustration element which is either generated as vectors on my mac or also hand drawn and scanned. A little bit of colour fiddling later I'm ready to print out on my professional printer onto intricately textured paper. They are also available framed or as prints on canvas. In my other work I also use Lino print - cutting relief designs and printing them using specialist inks - and screen printing. I love pattern and bright colours and drawing has always been a love. I worked as a full time graphic designer for eight years up until January 2011 when I left to go freelance, still doing design work but also enabling me to pursue my illustration and printmaking both online and at craft fairs. I've always collected quotes, not F1 related necessarily, but all kinds of things and so when I went freelance in January this year I started to use those quotes to create prints to sell in my shop and at craft fairs. When I saw The Senna Movie the 'you're no longer a racing driver' quote really stood out as being particularly distinctive to Senna, but also an inspiring sentiment for all areas of life. 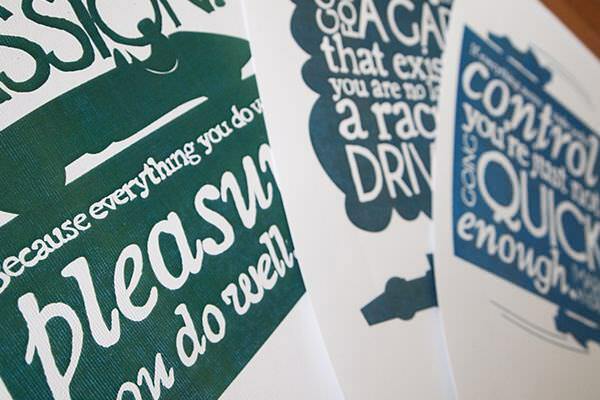 I decided then to create a mini series of my prints based around quotes from World Champions. I quickly found lots of inspiring quotes and chose the best three to start with. I also have loads of Stirling Moss quotes, but as he was never world champion then he might have to get his very own series! For more images and to see Sam's other designs and prints visit sam-osborne.co.uk, her Etsy shop or follow @samossie on Twitter. Next post Silverstone 2011 - Upgrade incomplete?